Who are Les Amies Louisianaises? Jeanette Aguillard, Janet Aguillard, Lisa Aguillard and Donna Thibodeaux were all raised in Acadian (Cajun) families in Southwest Louisiana. When Jeanette was a little girl she lived near Welsh where the legendary Cajun singer and accordionist Iry LeJeune lived with her family (the family of Milton Vanicor). After Iry married, he continued to live in Ardoin Cove near the Vanicor family. Jeanette's father and several members of her family formed the group "The Lacassine Playboys", the band which helped to launch the short but memorable musical career of Iry LeJeune. Janet's father, Cleadis Mott, played and recorded Cajun and Country music and Janet's grandmother sang her old children's songs which came from France. The father of Donna, Jessie Arabie, played fiddle; her grandfather played the accordion and there were numerous other musicians in the family. Any excuse was good to gather the family together for a house dance. They would take the kitchen table outside to make the kitchen into a dance floor. renaissance of Cajun music after the Second World War. He often gives fiddle classes to teach les old songs to young musicians who are eager to learn this traditional music. talented composer and singer of Cajun songs in French. And, of course, during their youth the four Amies heard Cajun music around them, in dances, at festivals and on the radio. But the tradition was that girls did not sing Cajun music. 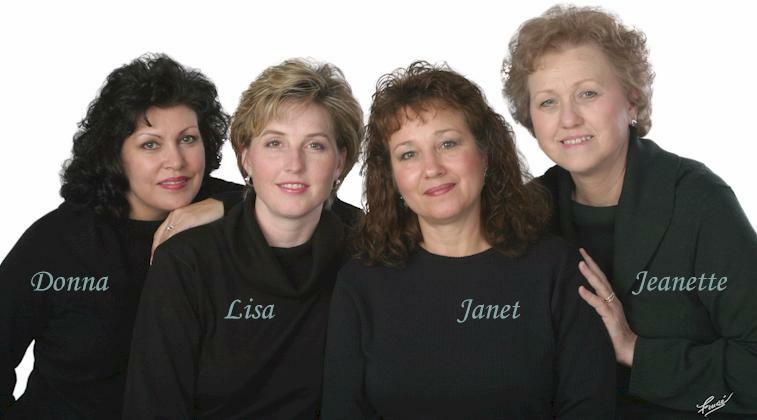 Les Amies met when they were part of a church choir. When Les Amies began to sing together, they wanted to present the unique music of their Acadian/Cajun heritage to a larger audience. That presented certain problems because traditional Cajun music was almost always sung by a man and the voices were rarely harmonized.